At Columbia Builders, we are ahead of the curve when it comes to energy efficiency. We believe that every home we build should not only be beautiful, but comfortable, functional, and durable as well. That’s why we go above and beyond the EPA’s Energy Star certification requirements. By employing the latest materials, innovative components, and industry best practices, Columbia Builders delivers more comfort and value to each of our homeowners. Our results speak for themselves! Prior to 2012, code mandated that new homes must have a HERS score of 100 or less. From July 2009 – December 2011, Columbia Builders’ homes achieved an average HERS score of 63! In 2012 through 2014, the code was updated and required a HERS score of 85 or less. The code change in 2015 lowered the HERS score to 70. 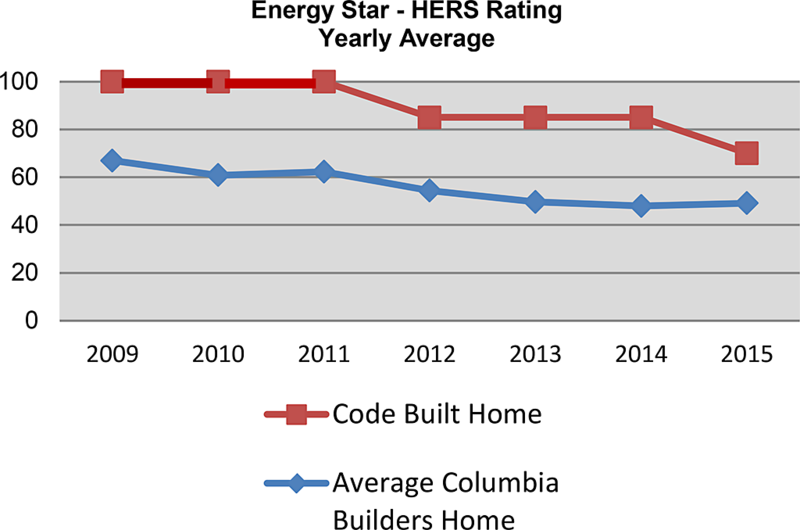 Columbia Builders’ homes have continued to achieve outstanding HERS scores that are well below the national average! CLICK HERE to view the individual HERS scores of our completed homes. As you can see, our homes exceed the requirements and you can be sure that your home will be comfortable and your utility bills will be low. Want to learn more about our home designs or communities? Get in touch with us today! We can even show you our energy efficient design in action at our model home. Simply give us a call at 410-730-0215 to speak to one of our friendly and knowledgeable team members. As the creator of landmark communities throughout Howard County, Columbia Builders has what it takes to create the home of your dreams. We build Energy Star new homes throughout Howard County, including Marriottsville, Fulton, Ellicott City, Glenwood, Clarksville, Dayton, Laurel, Columbia, and Brookeville.